Director Zack Snyder (Watchmen, 300, Sucker Punch) jumps up to ambitiously bring us Man of Steel. But having recently been branded as a hit-or-miss wonder, his latest project brings with it a lot of good and a lot of bad. 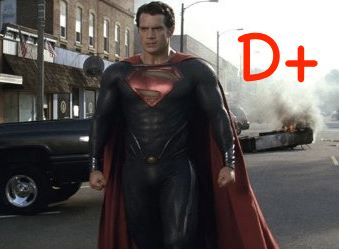 When a young "Kal-El" (Henry Cavill) learns of his father "Jor-El’s" (Russell Crowe) preservation of him as the sole survivor of the once-thriving and power world of Krypton, a growing Superman must discover himself and face his destiny as earth’s foremost defender against evil—specifically, against the forces of "Generel Zod" (Michael Shannon), as well as face the pressures from living on a very different world where his heightened senses and super abilities oppress him and cause him to be viewed as a threat. His parents "Martha and Jonathan Kent" (Diane Lane, Kevin Costner) do their best to warn him of the dangers that await. Snyder’s Superman is a passively ballsy attempt to re-vitalize Superman. The word "Superman" not being in the title and it being used only a couple of times in the film demonstrates this. Events are rearranged or augmented in a way so that we can appreciate their enhancements since the Reeves movies, but the good and bad of the film is indeed a mixed bag that continually offsets itself over and over again before finally dying of exhaustion (and exhausting audiences in the process). Unlike the 2006 film, earth’s beloved hero isn’t waiting up in space to listen for trouble so he can swoop down and save the day when a burglar tries to grab some lady’s purse. We meet him as a boy with the burdens of growing into a man with super powers. We feel the fear of his parents as they watch their son grow and make the hard choices. Other movies never played up this angle as they should have. And unlike other films – most with only the limited special affects of their time – we get hungry for Snyder’s meal of technical explanations for everything that is. Superman’s strength and all of his abilities are explained on a level that is seldom found in comic books; for instance, Superman’s reliance on the sun for strength here results in his becoming immediately powerless where sunlight isn’t prevalent (Sup's power should fade gradually when not exposed to a yellow sun, not instantly). But Snyder’s Superman is first and foremost a man, and his greatest challenge will be, first, in finding himself and his purpose, and second, in deciding where his true allegiance lies—to Earth or Krypton. Snyder takes us on a ride from Sup’s birth, to the expulsion of Zod to the Phantom Zone, and onto an eventual battle for the survival of earth. So much material had to be covered that the film being strapped for time was a problem not to be gotten around. Since it tries to do too much, the screenplay is a brain-racking mess. Nearly the entire movie consists of flashbacks to fill in the gaps and explain where we are in the present. But even then it isn’t done since more jackhammer melodrama follows the climax. Every thing significant about the plot is explained in so many words--sometimes in drama-heavy standoffs between the pummeling of Zod and Sup. But that is after things get rolling from the soap opera-like, revolving merry-go-round of flashbacks (one immediately following another) that take us a clear hour into the movie before we even have a foundation. From there, things do get more interesting as they get even longer with out-of-control CGI-crazy battles that are, frankly, a sad sign of the times in film today (not every punch or kick has to send someone flying through fifteen buildings, but Snyder thought that would appeal more to those with a sweet tooth for destruction). The only thing really super about this film is its length--and it feels even longer than it is. By the end, we are emotionally and physically tired from watching (and sitting). Cavill is an excellent Superman in every way. He way outdid my expectations for him. The only one to outdo him is Amy Adams as a truly fabulous Lois Lane. Together and apart, these two lead us through the scattered debris of material that composes Man of Steel. This is in sharp contrast to everyone else, including Lane and Crowe, who have to give it a while until they even seem like they want to be filmed. Michael Shannon is an impressive Zod when we can forgive the over-performances that compose half the scenes he is in. Nearly everyone in the film with anything to say has an active part. Yes, we are supposed to sympathize with everyone who has dialog, including the reporting staff at The Daily Planet, which further stocks up on useless material that could have been cut out. Just pick any segment in the film and you can spot plenty of examples that make it look like what we are watching is a first-draft. And it takes a real "all over the place" film to actually give you a raging headache like this one can. Hit or no hit, Snyder is a smart director and he throws a few curve balls into things to get us asking some questions and to keep us guessing. Most of the dialog is as noble and eloquent or more than you’d expect from any super hero film. At a few places, I came somewhat close to enjoying this film, which is why I say directors need to stop trying to chunk every possible plot detail into an already cramped script and then go back to tirelessly explain every damn thing as though we are idiots. And they need to count on people being cognizant enough to pick up on genuine drama when it presents itself naturally, and not stage it as though to say: "Look, this is a tender moment! Young Superman is playing with a towel which will one day be replaced with a cape!" Worse yet, they need to stop loop-holing the plot into small fragments in flashbacks and time regressions to try and mix things up. When done once, it can work wonders; when done repeatedly, it will ruin a film. It is because of these things that this project – a movie I went in really, really wanting to love – dropped the ball. Save your money, folks.